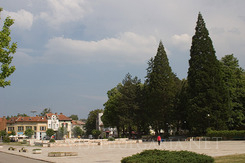 Berkovitsa, Bulgaria: City, resort town information and hotels. 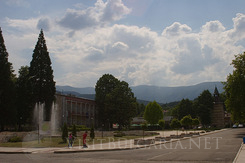 One of the future plans for development of winter tourism in Bulgaria belongs to the cozy and picturesque municipal of Bercovitsa. It is now a fact that the western parts of the Balkan mountain range are trying to catch up with the other winter resorts. The mayor of the town announced that the priority development of the tourism is written in the strategy of Berkovitsa municipal. Development: According to the plans a cabin lift will be constructed from Berkovitsa to Kom zone which is about 16 kilometers east from the town. At the moment the zone offers one ski piste with a drug- lift and three tourism bases with a total number of 100 beds. The plans of the municipal are to make the piste twice as large and to recover some old pistes so that the total length of the ski pistes will become 15- 20 kilometers. Berkovitsa municipal for the moment offers around 600 beds. The idea is on the upper station of the lift to be built a hotel with 100 beds and the rest to be built on the lower station in the town. Investors have already offered plans for the development of the infrastructure in the region. One of them is for 80,6 million euro. It is possible this offer to be supported by other Bulgarian and foreign investors. The latest news from the municipal is the contract between the municipal and “Olimp” joint stock Company for the development of a ski complex in the region of Kom peak. The capital of the new company is 10 million BGN. The first building sites of the new winter complex should be ready by the end of 2006. The town of Berkovitsa is situated in the northern foot of Berkovski Balkan (Western Balkan Range). It is 89 kilometers north from Sofia and 25 kilometers north of the Petrochan narrow. The largest part of the area is a hilly mountain terrain, very often cut through by ravines. The lowest point above sea level is in the village of Borovtsi - 250 metres, and the highest point is the Kom Peak - 2016 metres. 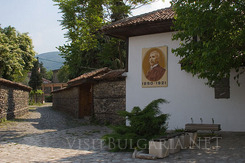 History: Berkovitsa is an old settlement. This is proved by the remains of a fortress and a church from the 4th century, situated on the top of Kaleto hill. The town is famous from the time of king Kaloyan (the beginning of 13th century). The town is first mentioned in a written document from 1491. During the Ottoman rule it is developed as a craft center- mainly woodworking and pottery. The house museum “Ivan Vazov”- The house itself has interesting exterior and interior architecture with wood carving on the ceiling and original fireplaces. Permanent ethnographic exhibition is also shown in another architectural monument. The clock tower is remarkable for its huge size and beautiful upper part with old clock mechanism. 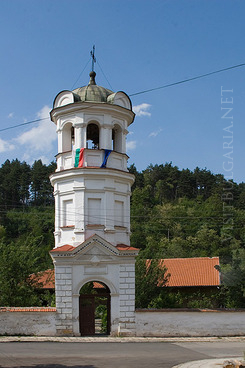 It is built in 1762 and is one of the oldest still standing towers in Bulgaria. Transport- Auto and rail transport connect Bercovitsa with the rest of the world. There are regular bus lines to Sofia, Montana, Lom, Varshec and many others small towns in the region. The northern slopes of Berkovski Balkan are famous for its chestnut forests- one of the few natural fields for chestnuts in Bulgaria. The town is a starting position for marked tourism routes in the Berkovski Balkan range. Kaleto is a forest hill (515) situated on the north- western part of the town. It is a natural forest park and protects Berkovitsa from the winds. Roman remains from medieval fortress are also situated in the site. The site Ashkilar is a romantic place south of the town, reaching the chestnut forests and is a great site for relaxation out in the nature.